Here's a couple more scenes kindly sent in by John Groucott. 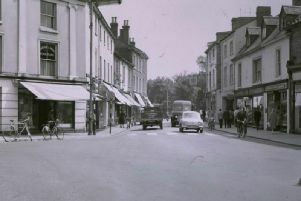 He is digitising his late mother Monica's slide collection and has found a wonderful selection of town centre pictures taken by his father Jim to share with Memory Lane readers. These two show views looking down Regent Street - notice how little has actually changed - and of the old Almshouses in Church Street. It's likely these were both taken in the late 1950s or early 60s, a little earlier than we originally thought, as the Almhouses were demolished in 1961.